THE FABRIC MERCHANT is our wee shop in the heart of historic downtown St. John's. 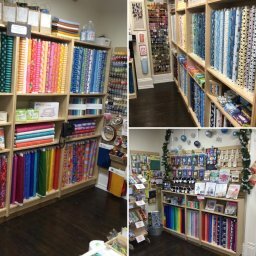 People walk through our door & say 'Wow, how bright, what colours, what fabric!' That makes our hearts sing, as we curate our fabric, handpicking our selection of premium Modern Quilting & Apparel Fabrics. Helping you find the perfect fabric to spark your creativity and bring your projects to life is our #1 goal. We are located on the third floor of Posie Row & Co in the historic Tobin Building on Duckworth Street. Open 7 days a week, our little shop is bursting to the rafters with fabulous modern fabric, select notions, books & patterns. aka Tall Uber-Chatty Shop Owner. I've always loved beautiful fabric & had a 'stash' before I even knew what that meant! 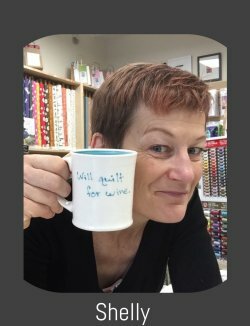 I started quilting when I turned 50 but spent more time buying fabric in the first year then sewing. I was dealing in pre-owned fabric and upon my return to St. John's that business morphed into THE FABRIC MERCHANT!" Shelly's 'Can't Live Without It’ Gadget: my Scissor Sitter as it holds my reading glasses & I can't do a thing without my reading glasses! Shelly's Most Quirky Possession: my set of fake ugly teeth. Shelly's Pet Peeve: Litterbugs! I am an avid PULalker - I pick up litter while walking my dogs. Sarah learned to sew pajama bottoms when she was 7 years old in her mother?s Girl Scout troop. Throughout elementary and middle school she did many different crafts from beading daisy bracelets to knitting scarves, but it wasn?t until high school that she really dove into sewing. Sarah learned to sew all of her dresses for high school dances with the help of her mom. She learned to install zippers and to read and tailor patterns as her techniques developed throughout high school. After high school, Sarah slowed down on her dress production and started making bags, among other crafts, to sell at a local craft fair near her hometown in Alaska. She was bitten by the entrepreneurial bug and has been selling her bags and pouches at craft fairs since 2011. She loves creating her own clothes and other functional items. 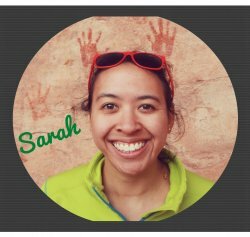 Sarah moved to St. John's in 2018 and has been teaching at The Fabric Merchant since. Hailey has loved fabric and sewing since she was very little, and quickly realized how much she enjoyed quilting when she was a young teenager, helping her grandmothers piece together their quilts. Her favourite thing is figuring out colour schemes for new sewing projects. Tucker loves nothing more than greeting you upon arrival at The Fabric Merchant. However be warned he has a tough time understanding that not all people appreciate a sloppy Lab kiss! 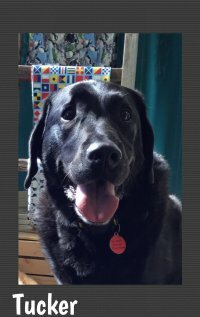 He also can be a bit of an Attention Glutton and has been known to literally sit on his corgi sibling in an effort to secure all the lovin’! aka Bennie the Mooch, Bennie the Dude. 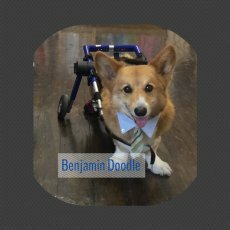 Always dapper in his made-to-measure ties & frequently seen free-wheeling down the streets of St. John’s, Ben has quickly become a local canine celebrity. When not snoozing at the shop he’s at home, trying to figure out how to open the fridge to get at the cheese! NEW TO THE TEAM: Monique & Beatrice. Details coming soon!